The first baby has been born using the transplanted womb from a dead woman, and British doctors say they are planning to replicate the procedure in the UK. 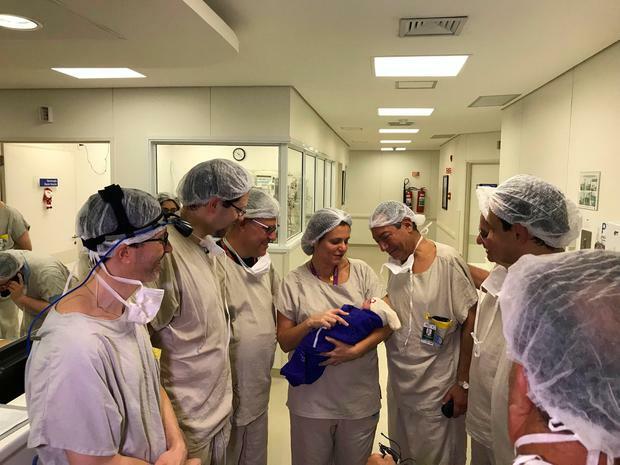 A team in Brazil transplanted the womb from a dead 45-year-old woman into an infertile recipient (32), who went on to have a healthy baby girl. Infertility affects one in seven people in Britain, and while some problems can be solved through IVF, most women with womb issues have no alternative but adoption or surrogacy. The first womb transplant baby was born in Sweden in 2013, using her grandmother's uterus, and since then there have been 10 other births. But donors are difficult to find and the surgical procedure to remove the womb from a living person can be dangerous. The breakthrough opens up the possibility of harvesting wombs from donor patients after death in the same way as other organs, ending the need for live donors. "The use of deceased donors could greatly broaden access to this treatment," said lead researcher Dr Dani Ejzenberg, of the Faculty of Medicine at the University of Sao Paulo. "The first uterus transplants from live donors were a medical milestone, creating the possibility of childbirth for many infertile women. However, the need for a live donor is a major limitation as donors are rare, typically being willing and eligible family members or close friends. "The numbers of people willing and committed to donate organs upon their own deaths are far larger than those of live donors, offering a much wider potential donor population." In the past few years surgeons have attempted 10 other womb transplants from deceased donors in the US, Czech Republic and Turkey, but none have been successful. The study was welcomed by British fertility expert Dr Srdjan Saso, part of the Womb Transplant UK team, who said: "Our hope, as we plan to kick-start the UK programme at the beginning of 2019, is for the deceased donor uterine transplant programme to grow alongside its 'live donor' counterpart."